DENVER, CO--(Marketwire - November 20, 2008) - Four Winds Interactive and USA TODAY have partnered on a digital signage initiative that will bring an unprecedented digital concierge to each new and redesigned lobby in the Courtyard by Marriott® brand. Debuting late last year as a prototype, the GoBoard™ acts as an interactive digital information center for guests, showcasing live news from USA TODAY and running off of the Four Winds Interactive digital signage software platform. 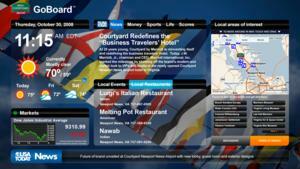 Now available in eight hotels, Courtyard expects to rollout the GoBoard and lobby redesign at 150 hotels by the end of 2009. Located next to the welcome podiums in the new Courtyard lobby, the GoBoard is displayed on a 57" LCD touch screen and is the technological centerpiece of the lobby redesign. The Four Winds Interactive digital signage software system supports the various types of content being displayed on the screen including USA TODAY, Microsoft® Virtual Earth™, weather, and local events, and then pushes them out to be viewed and interacted with by the Courtyard guest. Live USA TODAY news, money, sports, life, and scores serve as a centerpiece on the GoBoard as well as a 3-day weather forecast, live stock market quotes and airport delays. Microsoft Virtual Earth displays an interactive map identifying local points of interest and near-by restaurants, making the GoBoard the ideal tool for the business traveler who is not familiar with the local surroundings. Developed specifically for the Courtyard brand by Four Winds Interactive and USA TODAY, the GoBoard gives the user control over the output on the screen, making it an excellent tool to customize offerings based on guest preferences. Located in Denver, CO, Four Winds Interactive offers a full-service Interactive Digital Signage (iDS) software platform that turns LCD and Plasma displays into a flexible, reliable, easy to use digital signage network. With the iDS software platform, users get an easy to use digital signage system that demonstrates the flexibility to customize content and features to an individual client's needs. iDS leverages familiar Microsoft programs and integrates with multiple live data types, giving the system a truly unique competitive advantage. From single sign implementations to enterprise-wide solutions, the software offers the scalability to expand at any time and still utilize only one content manager interface. Offering a comprehensive feature set including a drag and drop user interface, multi-user security, broad content support and interactivity, the iDS software package is a universal solution for any user's digital signage needs. USA TODAY is the nation's top-selling newspaper. It is published via satellite at 34 locations in the USA and at four sites abroad. With a total average daily circulation of 2.3 million, USA TODAY is available worldwide. USA TODAY is published by Gannett Co., Inc. (NYSE: GCI). The USA TODAY brand also includes: USATODAY.com, an award-winning news and information Web site that is updated 24 hours per day; USA TODAY Sports Weekly, a magazine for enthusiasts of college and professional football and baseball; USA TODAY Mobile, offering up-to-the minute news and information on a variety of mobile platforms and devices; and USA TODAY LIVE, the television arm of the USA TODAY brand that brings the spirit and quality of the newspaper to television.